My little man is 7 today - Happy birthday Jamster! We are going to the cinema to see The Croods and out for lunch to celebrate. He has received so many lovely gifts from family and friends, all of which I am very thankful for! 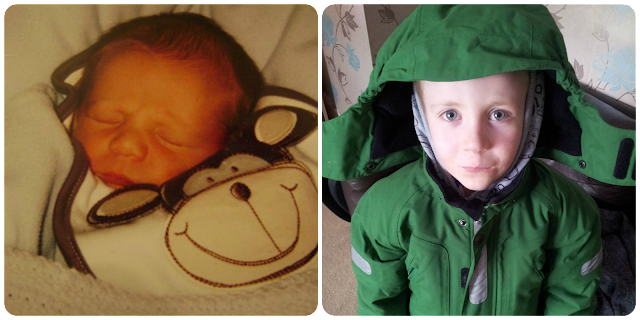 I don't know where the past few years have gone, he is a proper little man now. It's half term which means no early morning wake ups and lots of fun with the Mini Mes. We have some Easter crafts and baking to do and we are heading to the seaside in a few days time too. I do love lazy days and a relaxed routine. A good friend of mine treated me to lunch the other day to say thank you for all of the bits and bobs that I give her for her little ones. She is a lovely lady and it was really nice being picked up from work, taken to the pub and dropped back home after a delicious meal. Thank you! Switching off the alarm clock is almost my favourite part of the holidays :) Happy Birthday to your son, he looks very grown up! Happy birthday to your son. Glad you have had a nice week. Happy birthday to your boy for yesterday! Time really does go by quickly. Happy Easter! What a scrummy little baby he was, and he has grown into such a gorgeous young man with a beautiful face. You must be so proud of him? Happy birthday to him and to you.